Yet another gas company truck invades the serenity of the Hills of Gilmore Creek, where Sharen Hyde and Jeff Green have lived since 2002. 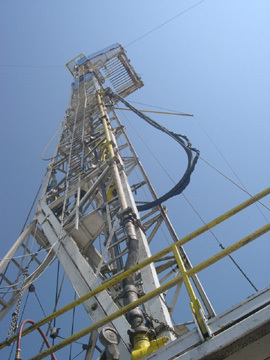 Heavy metal, big trucks, and loud noises are typical at drilling sites. Woodhaven�s Pete Fletcher, standing, moderates a meeting with gas company officials and residents. A Sagamore Hills church member isn�t interested in speaking to protesters. 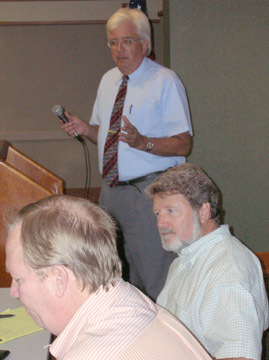 Don Young (right) is a vocal opponent of gas drilling near houses and parks. Barnett Shale drillers have hit a mother lode of angry neighbors. A 3,000-square-foot brick home on a large lot near Eagle Mountain Lake became Sharen Hyde�s dream spot in the summer of 2002. Dubbed the Hills of Gilmore Creek, the new subdivision currently boasts about two dozen homes, most in the $300,000 range. Hyde and her housemate, Jeff Green, are both engineers with fast-paced jobs; the promise of serenity and elbow room in rural Tarrant County seemed like the perfect elixir. Original deed restrictions forbade oil and gas drilling within the development. Hyde and other residents believe the rules were later changed illegally. �Right after I moved in, they started drilling,� she said, pointing toward a well a block away. Almost overnight, the neighborhood was besieged with heavy equipment, bright lights, and maddening noises at all hours. Gas companies started drilling in vacant lots beside houses or directly on people�s properties and smack-dab next to their houses. Big, heavy trucks overtook streets, parked in vacant lots, and stirred up dust clouds. Some drillers chose not to seal their sludge pits with protective linings, allowing water tainted with chemicals and post-drilling sludge to settle and seep into the ground. A gas company sprayed oil-drilling sludge across a green field and was later instructed by the Railroad Commission to till it into the ground to avoid run-off into freshwater sources. Like the muck being tilled, the lives of Gilmore Creek residents were turned upside down as the drillers converged. Pad sites were paved with gravel, and five gas wells were drilled, most within spitting distance of homes. Residents complained that water from their wells began taking on a sudsy appearance, a light brown tint, and the odor of rotten eggs. Empty fields were available nearby, but gas companies drilled next to houses where the roads and infrastructure were already in place. Frustrations like those felt at the Hills of Gilmore Creek are being replayed across Tarrant County and North Texas, where a natural phenomenon akin to Jed Clampett�s �bubblin� crude� is creating wealth for some and worries for many. Generations to come will recall the Great Barnett Shale Gas Boom of the early 21st century, when oil and gas companies dug thousands of holes in the rocky earth and pumped out natural gas that�s used to make electricity and to heat homes. Across North Texas, people lucky enough to own land and mineral rights are licking their chops, collecting bonuses and hefty royalties for allowing drillers to whack away. Noise and congestion don�t seem to bother people nearly as much when their pockets are jingling. For the rest, it�s plenty of clatter and calamity but no ka-ching. People are getting fed up with assaults on their quality of life. In Southeast Fort Worth, about 25 people met in front of a church on a hot August morning to protest. They carried signs handwritten with slogans such as �Just Because It�s Legal Doesn�t Make It Right� and �Where Would Jesus Drill?� Drilling hasn�t yet occurred in their backyards, but they were protesting because the church has leased property to a gas company for future drilling. The property is near a quiet neighborhood and a unique nature park. Farther north, residents in Woodhaven are also grumbling, but for different reasons. They opened their arms to gas drilling and its bonuses and royalties, and then wondered whether a city councilwoman and a few neighborhood leaders made a deal that steered money away from homeowners and into the pockets of an economic development group. Other folks around the county have started letter-writing campaigns, flooding legislators with demands for more regulation. These small pockets of resistance have been segregated by geography, with little or no collective organization � just small groups of people sprinkled over a dozen counties, fighting their own little battles. This lack of organization and political clout has created unobstructed opportunity for gas companies to keep wheeling, dealing, and drilling. The protesters have moved slowly, up to now. A more unified resistance, however, is beginning to take shape. Groups are discovering each other and embracing the strength-in-numbers concept, while an educational rally planned for later this month is geared to link activists and give them a higher profile at city halls. Hyde and Green quickly dug in their heels against the gas drillers that converged on their neighborhood and turned dream homes into Hell Houses three years ago. Just as quickly, they learned that their rights and recourses were few, especially in unincorporated areas that lack regulations to maintain minimum distances between gas wells and homes. Hyde wrote letters to newspapers, local politicians, state representatives, senators, environmentalists, and state agencies, with little result. One letter of complaint ended up at the office of U.S. Sen. Kay Bailey Hutchison, who responded with a letter to Hyde requesting a wide assortment of personal information, including her social security number. Hyde refused to provide the information. Hutchison�s deputy press secretary Jamie Loftus explained that Hyde�s e-mail had originally gone to another senator, who in turn forwarded it to Hutchison. �In accordance with the [federal] privacy act the senator was required to send the privacy form in order to initiate contact� with Hyde, she said. If Hyde�s letter had come directly to Hutchison�s office, she said, the form wouldn�t have been needed � and in any case was not intended as intimidation. Most officials referred Hyde to the Texas Railroad Commission, the state agency charged with overseeing the oil and gas industry. But if besieged homeowners expected that agency to swoop in like Mighty Mouse and save the day, they were disappointed. The under-staffed and industry-influenced Railroad Commission inspects a small percentage of wells annually. Currently, about 84 inspectors oversee 358,000 active and inactive wells. An estimated eight of 10 wells go un-inspected each year. Oversight is lax in protecting groundwater supplies from depletion and possible contamination. Gas companies drill their own water wells and pump out millions of gallons from the same underground aquifers relied upon by residents. The companies then force the water into underground pipes at high pressure to fracture the shale and extract the gas. Sometimes the backwash, laced with lubricants and chemicals, is dumped on the ground. West bought about six acres in 2003 and started building his version of the American Dream, a sprawling brick home with a swimming pool, three-bay garage, and workshop. The house was being framed when an illness in the family forced him to travel out of state for nine days. When he returned, somebody had carved out a spot for a gas well directly next to his house � on his own property. �They had built a pad on my property that is about 400 feet by 300 feet of gravel, and they leveled my land,� he said. Gas wells, a sludge pit, piles of rock and debris, and a steady stream of trucks swallowed his back yard and rendered it useless to him. Hills of Gilmore Creek residents would discover that owning surface land in Texas isn�t the same as owning rights to minerals underneath the ground. Laws give mineral rights owners access to otherwise private properties. Cities have some control over drillers, although not much. People in unincorporated areas are most vulnerable. Drilling for natural gas in 2005 is a cleaner, more efficient operation than in the wildcatter days of old. Horizontal drilling means one well can access numerous pockets of natural gas in multiple directions. Industry officials tout newer techniques and fewer environmental problems, but drilling remains a dirty job with heavy, noisy equipment and the potential for environmental troubles. Natural gas is a close cousin to crude oil. Tapping into its veins can be risky. Gas lines can rupture, and fires are always a danger with that much fuel at hand. Water sources can be depleted or contaminated, surface lands fouled, wildlife scared away. West and some of his neighbors are infuriated that gas companies intruded on their paradise to reap profits without concern for those in their midst. Property values fell. The Tarrant Appraisal District reduced the appraised value of West�s property from $475,000 to $180,000. West�s bitter battle with Chief Oil & Gas included an accusation of armed assault. A gas company official called the Tarrant County Sheriff�s Office and complained that West had forced him off his property at the end of a shotgun. A deputy investigated and, according to West, told him, �I don�t blame you.� No arrest was made after West denied the incident happened. West has since filed lawsuits against the subdivision developer and Chief Oil & Gas. After numerous disappointments, he found a small measure of satisfaction through the Railroad Commission. Both West and Green complained to the state agency after noticing an oil slick in an unlined sludge pit that had been left unprotected, creating a danger for kids, pets, and wildlife. Chief was told to �de-water� � remove liquids � from the pit and then cover it up with dirt. Later, West noticed that the gas company was covering the pit with the liquid intact. He took photos and complained again to the Railroad Commission. Eventually, Chief followed orders. Yet after twice being caught breaking rules, the company suffered no penalties. From 2002 to 2004, the Railroad Commission reported four infractions in Tarrant County that resulted in fines to gas companies, with fines ranging from $2,250 to $20,000. Three of those fines came after gas companies dumped drilling fluids onto the ground; none were levied against Chief. �It didn�t reach the enforcement stage because they did what we told them to do; they did de-water it and fill it in correctly,� agency spokeswoman Ramona Nye said. Incidents like this drive people batty, but the neighborhood�s organized resistance is admittedly �going very poorly,� Hyde said. Still, she is resolute and plans to attend a summit meeting of the Oil and Gas Accountability Project (OGAP) on Oct. 28-29 in New Mexico. The Colorado-based group works with communities to reduce the social, economic, and environmental problems caused by oil and gas development. Gwen Lachelt founded the organization in 1999 after 10 years of fighting the oil and gas industry�s coal bed methane wells in Colorado. After meeting scores of other people waging battles against drillers, she established a centralized clearinghouse for information on how to deal with the industry. Individual contributors and private foundations � but no government funding � support the nonprofit group, which created an instructional booklet for landowners. The group also provides resources on the political landscape, state regulations, and legislative measures being considered. Hyde hopes the upcoming summit�s array of speakers and experts will give her neighborhood and others an edge. Wars waged against drillers aren�t confined to the gas patches. 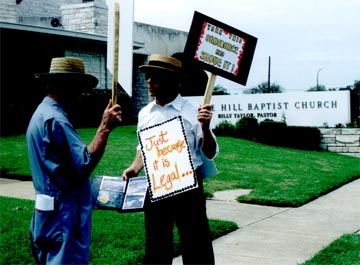 On Aug. 28, two dozen protesters waved signs and traipsed up and down the sidewalk in front of Sagamore Hill Baptist Church in Southeast Fort Worth. The church owns property near Tandy Hills Park and agreed to allow Four Sevens Operating Co. to drill there. Houses are also nearby, and residents didn�t cotton to the idea of drilling so close. Some church members stopped and talked to protesters and lamented that their church needed repairs � gas royalties could pay for a new air conditioner. That didn�t sit well with protester Tommy Eaton, who lives adjacent to the proposed drilling site. �I asked them if my grandson�s life was worth their air conditioning,� he said. Well blowouts are rare but do occur. Leaky pipelines can release invisible and poisonous gases into the air, pollute water sources, or cause explosions. In recent years, gas pipeline accidents have caused huge fireballs, injuries, evacuations, and property losses, but few deaths. A gas blast in 2000 killed a dozen people at Carlsbad N.M., not far from the Texas border. In part because of such dangers, some cities have banned drilling outright or prohibited wells within 1,000 feet of houses. Most cities, including Fort Worth, are more lenient. Fort Worth requires 300 feet � the length of a football field � between wells and houses. 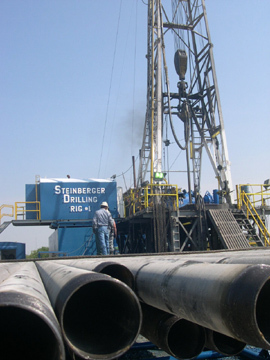 Outside city limits, it�s open game for drillers. After church services ended, Sagamore Hill members strolled past the protesters. Most were pleasant but didn�t stop to listen to what the activists had to say. Some members walked with eyes straight ahead, ignoring the protest. A few made mildly hostile remarks. 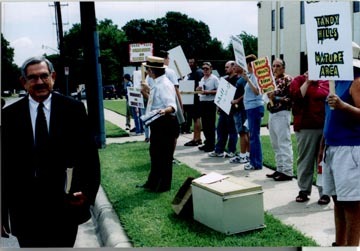 A man wearing a sharp suit and carrying a Bible kept his eyes fixed in a straight-ahead stare as he walked past the protesters. Asked to discuss the church�s decision to lease to drillers, he continued without slowing. �You missed a good sermon,� he said, refusing further comment. At about 12:30 p.m., Pastor Billy Taylor stepped out to talk to protesters. Taylor is a gray-haired, stocky guy with a benevolent smile that served as a shield against the protesters� pleas. �I hope you all accomplished whatever you came to accomplish,� he said. The group urged him to cancel the lease with Four Sevens, or sell the property to the city to be folded into the nature area, or sell to a group that would then donate it to the city. Tandy Hills is a one-of-a-kind park with native prairie grasses and an array of plants difficult to find anywhere else in the city, they told him. Taylor smiled and said the gas drillers had assured him that the neighborhood and the park wouldn�t be negatively affected. �The gas drillers say whatever they need to say to get a lease,� protester Don Young said. After several minutes, Taylor excused himself. The protest didn�t appear to have accomplished much. Few minds were changed. The lease stood. Gas drilling appeared inevitable. Early on in the rush to tap into the Barnett Shale, most protests were directed toward drillers. That began to change after cities, including Fort Worth, started making deals. Fort Worth officials expect to make millions of dollars in the next decade or two and have pinpointed prime locations for off-site drilling, including city-owned land next to municipal airports, a wastewater plant, and Gateway Park, Quanah Parker Park, and Tandy Hills Nature Area. The city in 2001 enacted the ordinance prohibiting gas wells within 300 feet of houses. Drilling at the time was mostly occurring in far north Tarrant County and hadn�t invaded neighborhoods. The city decided on the 300-foot perimeter after studying a number of similar ordinances around the country, said Assistant City Attorney Sarah Fullenwider. Residents have asked the city to review the ordinance. Installing a gas well means beating down a couple of acres for an access road and a gravel pad, erecting lights and a tall derrick, and creating noise and odors 24-7 until the well is completed. Gas companies say that stage lasts only a few weeks, but residents say the process often lasts much longer when horizontal drilling is used in multiple directions. And even after the well is capped, an ugly pad site and a steady stream of heavy truck traffic remain long-term annoyances. Those suspicious of drillers also cast a wary eye toward a strong oil and gas lobby, a Bush administration that caters to the industry, a diminished Environmental Protection Agency, a local mayor with a background in oil, and a city council scrambling for money to fix potholes in streets � the same streets brutalized by heavy trucks going to and from the drill sites. �A 300-foot separation between wells and houses is far too little,� said W.C. Whitehurst, who has lived in Southeast Fort Worth�s West Meadowbrook neighborhood for half a century. �A major explosion is capable of tearing up a quarter mile and killing people. When it encroaches [on] neighborhoods, anything less than 2,000 feet is inadequate,� he said. Cities take the money offered by gas companies and often downplay the effects of drilling on communities. Yet Fort Worth neighborhood police Officer Augustus Green recently wrote in an e-mail to neighborhood association members that gas drilling attracts thieves as well as increasing heavy vehicle traffic and noise pollution. �If you�re on the fence about this, think about the crime that will come with gas well drilling,� Green wrote in August. Just north of I-30 in East Fort Worth, another neighborhood is rallying against a gas company and the city, but with a different spin. Most property owners in Woodhaven own their mineral rights and stand to collect royalties, yet drilling won�t occur in their backyards due to a dense residential area and the city�s 300-foot rule. Still, some residents question whether a gas deal was intended to cheat them out of money while helping fill the coffers of a community development group. After Four Sevens inked a deal with Woodhaven Country Club to drill horizontally under its golf course, the gas company showed interest in drilling under 300 acres of nearby residential property. The nonprofit Woodhaven Community Development Corp. ramrodded the deal. The group serves as a kind of Chamber of Commerce for the neighborhood, promoting economic growth. Residents say Haskin was a director when the group was established in 1998 and stepped down only after city attorneys advised her that a city council member leading a nonprofit group while voting on issues that could financially benefit that group and its neighborhood could be a problem. The fact that Haskin removed herself from the board of directors doesn�t mean her influence on the group waned, said neighborhood activist Louis McBee. �The Woodhaven Community Development Corp. is Becky Haskin,� he said. �I guarantee you she is running that group.� Haskin didn�t return a call seeking comment for this story. McBee, who earlier this year lost a bid to unseat Haskin from her city council seat, claimed Haskin pressured homeowners to sign the lease. �Becky said the straw is in the ground, so you better sign up now or lose out,� he said. McBee, Pete Fletcher, Norm Bermes, and a handful of other homeowners became concerned after a deal was struck without competitive bidding. Suspicion increased when word spread that Four Sevens had given the nonprofit group $90,000. Woodhaven Community Development had signed up residents and been paid a large amount of money, and appeared to have brokered the gas deal and received a commission, a no-no for a nonprofit. Some felt the money should have gone to property owners and resented that an economic development group that doesn�t invite residents to meetings was, in effect, representing them in negotiations without seeking their input. Four Sevens held a public meeting, but residents complained that there was not enough room for everyone to attend, discussions were difficult to hear, and their questions weren�t answered. Fletcher was astounded that no competitive bidding had occurred. �This is just bad business,� he said. He and a few other homeowners distributed fliers with the heading �You Want A Better Offer For Leasing Your Property For Oil And Gas Exploration?� and urged residents to attend a Sept. 7 meeting at the local branch library. About 75 people came to hear Llano oil and gas company officials make an offer that appeared to be more lucrative than the Four Sevens deal. Involving two gas companies wouldn�t kill the deal but could make it more complicated. For instance, if some residents signed with Llano and the rest signed with Four Sevens, the two gas companies would have to form a joint venture and decide between them which company would do the drilling. Until this summer, a company or consortium of companies had to obtain permission from mineral rights owners of at least 40 contiguous acres before drilling could begin. On July 11, at the request of gas companies, the Railroad Commission reduced the space to 20 acres. After the meeting, Rick Disney, a legal liaison for Woodhaven Community Development, defended the Four Sevens deal, saying the bonuses and royalties were comparable to others. �Due diligence was done, and [the deal] was consistent with what�s in the area,� he said. Money given by Four Sevens to the nonprofit group was a �contribution� rather than a commission, he said. It remains to be seen how many residents will shun Four Sevens in favor of Llano. Fletcher, the meeting�s moderator, admitted he had already signed with Four Sevens and planned to honor his agreement; he simply wanted competitive bidding to occur, and he wanted residents to be involved in their fates rather than relying on the directives of an economic development group controlled by a select few residents and business owners. Meanwhile, Woodhaven, Hills of Gilmore Creek, and Meadowbrook are just a few of the many neighborhoods in Tarrant County that are dealing with gas companies. The hubbub is occurring almost everywhere drilling takes place, but only now are local residents trying to strengthen their position by becoming more collaborative. Leading the charge is Don Young, who is expanding his small activist group, Friends of Tandy Hills Nature Area, into a citywide organization designed to educate and unify residents affected by gas drillers. Called Citizens Against Neighborhood Drilling Ordinance (CAN-DO), the group will urge the Fort Worth City Council to expand the distance between wells and houses to 3,000 feet. �The city is talking about extending the distance to 800 feet, but that�s another cop-out, a slap in the face, a cave-in to the oil and gas people,� he said. CAN-DO will hold an educational rally Sept. 24 at Scenery Hill, also known as Broadcast Hill, near the KXAS-TV tower in East Fort Worth. The group is contacting neighborhoods across the city affected by drilling and is running ads in local newspapers. The ads were paid for by donations. �A lady came by last night and gave me a check for $1,000,� Young said. What does he feel is at stake? �We still have a chance to keep Fort Worth a livable city,� he said. You can reach Jeff Prince at jeff.prince@fwweekly.com.